Search For "Legal" Companies in Wagoner, Oklahoma - Click Here Now! The Wirth Law Office - Wagoner, With Local Wagoner Attorney Paul J. Sowinski, Provides Legal Representation To Wagoner County Residents In The Family Law, Criminal Defense, Bankruptcy And More. 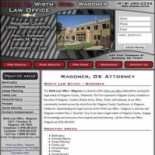 Wirth Law Office - Wagoner Attorney in Wagoner is a company that specializes in Legal Services. Our records show it was established in Oklahoma.